Where do I start to describe "La Marie Galante"? My vocabulary doesn't contain enough superlatives to make this review what it ought to be. In short: if you want to eat sea food at the highest level, look no further. 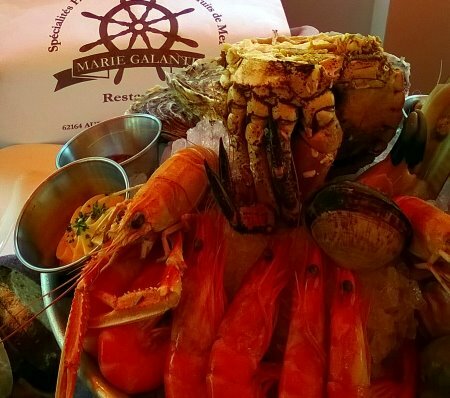 "La Marie Galante" is the place to be, if you want to try "un plateau fruits de mer". The best translation would be "a feast of shell fish." Many years of experience show off: from the presentation, to the service, to the tiny little towel the size of a button, that swells up in the warm water provided: everything is superbly orchestrated and presented. The downside is that many years of experience have made many years of happy customers, and that it is absolutely vital to book a table well in advance, since there is rarely a seat available at "La Marie Galante". We went there on a week day in April, had a stroll along the rocky beach (panoramic photo on top) and enjoyed what the sea had to offer, through the hands of "La Marie Galante". "La Marie Galante is ab-so-lu-te-ly worth a visit!